This boutique property is lovingly maintained with a warm staff and charming facilities. I really liked that we were provided with an after-hours contact. It was nice to know there was a contact in the event of emergencies. This facility was wonderful. I liked the fireplace in the room and I also liked the fully-stocked kitchette in the cottage. The rooms are cozy and clean, it has everything that you need for a quick get away. although the place is under renovation, it allow us to have the most pleasant stay. Nothing. This room was horrible for the purpose of getting a nights rest. Nice courtyard of the room, friendly staff, beautiful grounds in sunny Carmel Valley, plus the bonus: you can walk to downtown area wine taste and go to dinner. EVERYTHING!!! Most incredible little motel I’ve ever stayed in! I would give them a 10 from start to finish! Great central location near shops, restaurants, and hiking. Very sweet cozy pool area. A couch in the room instead of just dining chairs. We loved the fact that we could bring our dog. The pool was beautiful. It was wonderful to be able to walk to town. Staff was awesome. Love that they are trying to update while keeping the charm. 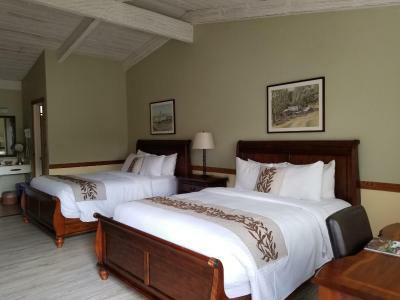 Carmel Valley Lodge This rating is a reflection of how the property compares to the industry standard when it comes to price, facilities and services available. It's based on a self-evaluation by the property. Use this rating to help choose your stay! Surrounded by large flower gardens, this lodge offers a seasonal outdoor pool from May to October. Carmel-by-the-Sea is 15 minutes’ drive away. 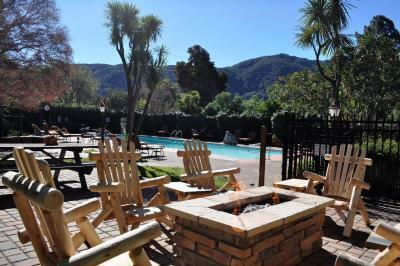 Great views of the Santa Lucia Mountains are offered from this lodge. 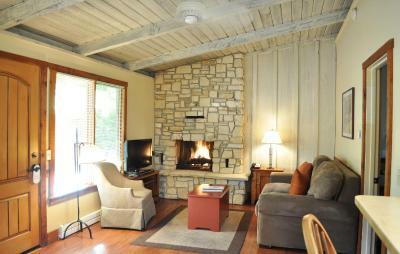 With a private patio, all of the warmly decorated rooms at Carmel Valley Lodge come equipped with cable TV and a fireplace. Each room has high ceilings and a modern bathroom with either a bathtub or shower. A continental breakfast is offered and includes local pastries, yogurt, fruit, hard-boiled eggs, and coffee and tea. Featuring 28 wine tasting rooms, shops and one-of-a-kind restaurants, Carmel Valley Village is just a short walk away from this lodge. Offering beautiful walking trails, Garland Regional Park is just 7 minutes away. Scenic Big Sur is 1 hours' drive away. 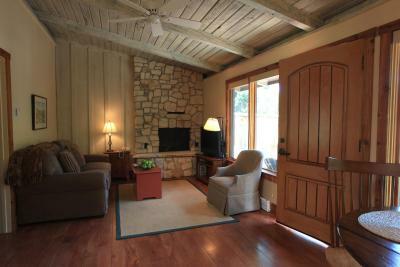 When would you like to stay at Carmel Valley Lodge? Featuring a patio or a terrace, this room includes an electric fireplace. Cable TV and a refrigerator are provided. This room features a private bathroom with a tub/shower combo. A small refrigerator, free WiFi and cable TV are included. This suite features a living room and a dining area. A kitchen is provided as well. A cable TV and free WiFi are included. House Rules Carmel Valley Lodge takes special requests – add in the next step! Carmel Valley Lodge accepts these cards and reserves the right to temporarily hold an amount prior to arrival. - Select room area pet friendly. Please contact the property for details. - This dog-friendly hotel allows a maximum of 2 dogs per room. Great place for a weekend getaway, well appointed spacious room that have comfortable beds. Especially like the fireplaces. Pool and spa are close to the rooms. We also had a table and chairs to sit outside the room in the sun. Would’ve been nice to have a microwave or coffee maker in the room. Staff made sure hot tub was turned on. They had the best blueberry muffins !! One of the noisiest hotel rooms I’ve ever experienced. The room had interconnecting doors into the rooms next door. I could hear the dude next door Skyping his family loudly, and the couple next talking and joking. Had to watch a movie on my laptop with head phones on to drown the noise. Reading wasn’t an option. And had to sleep in earplugs. Was looking for a peaceful valley experience and left feeling really let down. Budget motels are quieter ! The bathroom could have been a bit more updated. The fellow at the front desk did not represent the hotel well. Cream and sugar for the coffee! Lovely location, great pool and hot tub, rooms were excellent.